Throw away the number for Chinese takeout! You will make this and wonder why you ever bothered before! It is easy and SO delicious. I know I am not alone when I say, sometimes we even surprise ourselves, right? Well, this turned out so good, I can't imagine ever ordering it anywhere again. I will be disappointed every single time. 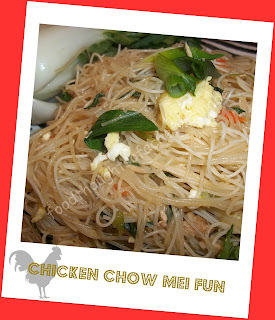 This is my favorite Asian food dish and it is my first attempt to recreate it at home. I rarely hit it dead on the first time, but I did this time folks! In my family, we are major Asian cuisine fans. Any of it! Friday nights were always Chinese food nights, at our house. Of course, so were Saturday nights, Tuesday nights, etc... You think I am kidding? My son didn't want a regular after school snack, he wanted to run down the street for some wonton soup, or egg rolls after school. Everyday. "Fun" refers to the noodle being made of rice flour or mung bean starch. *My, to the point description* The rice noodles would be comparable to angel hair pasta. Very thin, and oh so yummy. You could really add any vegetables you want to this. I always claim to be a purist. However, with this dish, it kind of depends on where you go as far as what is in it. I took the ones that are always in it, every time I order it and went with it, so it is my "real deal". For this dish, you don't need many specialty items. Of course you do need rice noodles, and you do need bok choy. In a bind you could replace the bok choy with cabbage or napa cabbage. Otherwise, go with what you have on hand or with what you love. I will tell you this recipe, is fantastic. Did I mention that? So I think you should make it my way first, and then next time, because I guarantee you there WILL be a next time, you can change it up how you like. The key to cooking any Chinese food that is a cooked in a wok or in my case a LARGE frying pan is having everything prepped. I will take you step by step through it. All of the veg prep can be done ahead of time. I did it this morning for dinner tonight. First let's make the sauce. In a bowl combine, soy sauce, chicken stock, ginger, cornstarch and white pepper (and ginger if you are using it) . Mix thoroughly and set aside. Make sure veggies are fresh. I used my food processor and laid 3 inch pieces of celery on its side in the feeder and zapped them so they were longish grates. I thinly SLICED the carrot, took it out stacked them and julienned them. I then ran my frozen chicken breasts through the with the slicing blade as well. It perfectly sliced them. Put your carrots and celery in a bowl of cold water to keep fresh *especially if you do it in advance which I did*. Put chicken in a bowl with a few squirts of soy sauce to marinate while you fix your pasta. You can do all of this in advance as well!! Chop bok choy just like you would lettuce. To prepare the rice noodles you will put them in a bowl. Make sure it is a big enough bowl so that you can fill it with hot water to cover them. Boil hot water and pour down over the noodles until covered. Let sit approx 30 minutes and they will be perfect. Drain them and set aside. They will not clump or stick like regular pasta! In a wok or LARGE skillet, pour in 3-4 tbsp of oil. Peanut, canola, veg, whatever. Let heat until a bit of smoke can be seen coming from it. Add chicken and you must constantly be moving it around. I use a wooden spoon or chop sticks. When chicken is done, add carrots, bok choy, green onions and celery, continue to fry 2-3 minutes. Next go the eggs! Don't forget! Continue to constantly move the food around the pan. When the eggs are done toss in the rice noodles that you have drained. Combine thoroughly and then pour in sauce. Cook another 2-3 minutes, tossing and moving it around to make sure all the pasta is coated. When it is coated and smells amazing, it is time to eat! This fed 4 people and there is enough left for 2 lunches tomorrow!! I truly hope you try this dish and enjoy it as much as we did. Let me know what you think!! Going to start cooking now. We like it a bit sweeter. Going to add a little sweet chili sauce to the mix.